How did public access to art evolve over the course of the eighteenth century? From the beginning of the century to the century’s end, it went being a very elite preoccupation to one that was shared by a healthy cross section of the educated middle classes, and that was really the result of the Enlightenment movement combined with increased education and upward economic mobility across eighteenth-century Europe. Part of being educated in the eighteenth century included a knowledge of the arts and letters. One witnesses a growing desire on the part of this broadening segment of society, a larger educated middle class, to have access to works of art, which had traditionally been in in the hands of the super-rich and only accessible to the elite. During the eighteenth century the Louvre was transformed from a private palace to a public museum. How did this happen? As part of the Enlightenment process, in the course of the second half of the eighteenth century, we find priestly and royal collections gradually opening to a wider public. The Enlightenment put pressure was put on these rulers, and in order to appear as an Enlightenment monarch, one who is in step with the times, a number of noblemen and kings across Europe opened their private collections to selective viewing on still an elite, but not exclusively aristocratic, public. This was going on in Italy and Austria, and in France the same pressures were brought to bear. 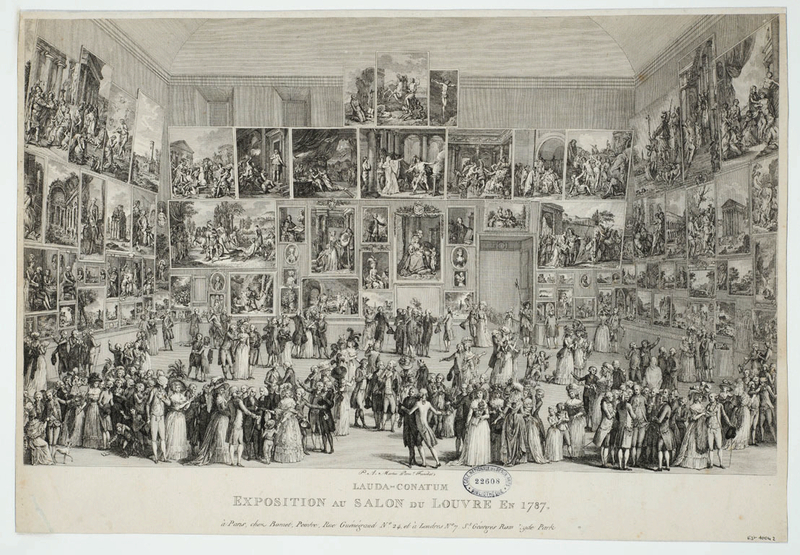 Starting in the 1750s, parts of the royal collection were open to the general public at the Luxembourg Palace and there were efforts across the latter part of the eighteenth century to turn the Louvre into a public museum. The effort was underway while there was still a king on the throne, but by the time of the Revolution those efforts had yet to be realized. The Revolution fast-forwarded this project that the monarchy had failed to achieve, and the revolutionaries were able to claim the Louvre as their own. The Louvre as a museum was a product of the French Revolution, and it came to be prototype for other museums throughout Europe and then the United States. Symbolically, they transformed the Louvre, which was a royal palace, into a palace of the people, in that you were not a guest of the king, but rather you were walking into a building that belonged to everybody and viewing art that belonged to all. Revolutionaries made sure that a museum is absolutely public, open fully to everybody, not just the selected elite. They also appropriated the property and the art of the nobility and the Catholic Church and turned those holdings, theoretically, into the property of the nation. This concept could apply to the National Gallery of Art in Washington, which is supported by the taxpayers and belongs, in some abstract sense, to the country as a whole. How did Philippe II, the Duke of Orléans, play into this movement to make art accessible to the public? He played an important role indirectly in this process of making things public in the early part of the eighteenth century by affording access to visiting elites and to artists in Paris. In his time the royal collection was out at Versailles, some twenty miles away from Paris, so visitors to the capital city only had access to a small number of private collections and the Orléans Collection was the grandest of them all. These visitors were very happy to have access to his palace and this fabulous collection, which was easily the finest private collection in France, outside of the kings, and one of the very best in Europe. In a way, access to the Orléans Collection made the inaccessibility of the royal collection all the more striking. You find critics complaining that while the Orléans Collection was generously available, at least to the elites, the royal collection was squirreled away outside the city and virtually unknown. This leveraged, if you will, and put pressure on the royal family to bring a segment of their collection to Paris, to be put on view in the Luxembourg Palace, where it then rivaled the Orléans Collection in terms of quality of what could be seen. Once that happens, after the royal collection establishes a foothold in Paris, the Orléans Collection fades a little bit into the background. It remained a private collection, still open to the elites but not the general public, and the rapid escalation royal collection going public leaves the Orléans Collection in a kind of static place of a distinguished private collection, which it remained until it was in effect liquidated around the time of the French Revolution. About Andrew McClellan: Trained in European art of the early modern period (primarily 17th-early 19th centuries), Andrew McClellan has lectured and published widely on painting, sculpture, and architecture, as well as the historiography and institutions of art. 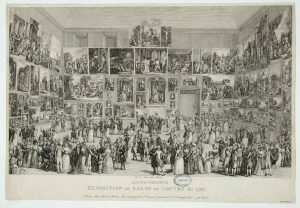 An overriding interest in contexts, institutional frameworks, and the reception of art led him to study the collecting and display of art and forms the basis of four of his books, Inventing the Louvre: Art, Politics, and the Origins of the Modern Museum in Eighteenth-Century Paris (1999), Art and Its Publics: Museum Studies at the Millennium (2003), The Art Museum from Boullée to Bilbao (2008), and The Art of Curating: Paul J. Sachs and the Museum Course at Harvard (2018).